An easy financial accounting flowchart maker that helps make financial accounting flowcharts with free templates. Quickly and easily create financial accounting flowcharts in minutes. Discover why Edraw is the simplest and easiest, yet most powerful financial accounting flowchart maker: Download it Now. 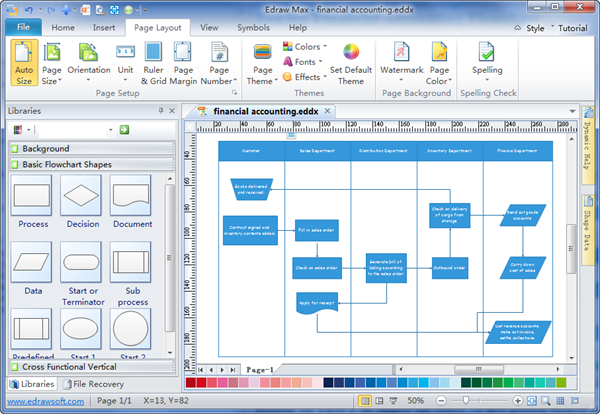 Edraw financial accounting flowchart maker enables users of any level to build accounting flowcharts instantly. Accountants can deal with the boring numbers in a more fun way with it. Edraw members are dedicated to providing diagramming solutions that are best of breed. Included are many smart symbols and examples, so even beginners can get used to the software quickly and create presentation quality diagrams. For people already accustomed with other Microsoft apps, such as Word or Excel, the interface will be quite familiar. Shapes can connect automatically so you only need to drag and drop shapes, apply built-in designed themes, and share your finished financial accounting flowchart in various formats by only one click.